322 new dwellings planned for Leeds City Centre. 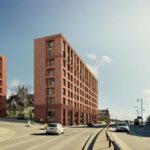 York based development company S Harrison has submitted a planning application to build a major new apartment development for the private rented sector (PRS) in Leeds city centre. The site consists of two parcels of vacant land between East Street and Ellerby Road which are allocated for residential purposes in the Aire Valley Leeds Area Action Plan. The development would create 322 one-, two- and three-bedroom, rental apartments spread across four buildings that stand between seven and nine storeys high. In addition, the development includes secure undercroft car parking and cycle storage facilities, as well as a residents’ gym, café and commercial space. The cluster of buildings feature floor to ceiling glazing and will be built using red brick, which is in keeping with many neighbouring buildings. The development would be formed around a central courtyard and incorporates more than 1,650 square metres of flowing open space. Gavin Douglas, from S Harrison, said: “This site is on a key gateway into Leeds city centre from East Leeds and is just a short walk from the main city core. It also sits next to St. Saviour’s Church, and we’ve created a design that frames the view of the magnificent Grade I listed building from East Street. The development has been designed by Leeds architecture practice Carey Jones Chapman Tolcher. S Harrison is currently developing affordable and private sale new homes at High Stakesby in Whitby, and it was also behind the transformation of the Grade II listed Hunter House, which is just 120 metres from York Minster into apartments. Last year the company completed work on another major development in Leeds city centre on Blenheim Walk. The student accommodation scheme, known as Blenheim Point, consists of 180 en-suite bedrooms, divided into cluster apartments, over seven floors. Previous : Insulation | Can premium products help cut overall costs?